A found rose by John Hook of La Roseraie du Désert this variety was from Laujuzan, France. A French variety from 1899 with large blooms and upright growth of 3-4' in height depending upon your growing season. A French introduction in 1872. This tea rose varies greatly in color with the time of year and corresponding temperatures, varying from orange to apricot and cream shades. A French introduction in 1897, you will appreciate the vigorous growth of the shrub size variety. Generous in quantity of blooms. A found rose from France in 2008, by John Hook. The flowers have an interesting blending of color and form as they age. Bred in France in 1887 this is a vigorous tea. Blooms are in clusters on upright growth. The color varies showing oranges, yellows and various red shades with the season and environment. A Bermuda Mystery Rose, this is a delightful tea rose. Blooming is very, very generous, a variety every rose lover will enjoy. From 1834 in France Bon Silene offers a pleasant fragrance emanating from ruffled deep pink petals on the large blooms. An Italian rose introduced in 1913 the blooms very in color from pink to apricot with yellow shading depending upon the time of year. An unknown variety discovered in 1858 this plant varies greatly in color depending upon the climate, going anywhere from a yellow, a pink blend or a magnolia white. We show just 2 photos to show a portion of the color range. Duchesse de Brabant is an Earth-Kind® rose from France in 1857. It is very generous in the number of blossoms, and shade tolerant. E. Veyrat Hermanos was bred in France in 1895 and possess a sweet fragrance on blooms varying from carmine pink to an apricot yellow. An 1881 introduction from France, producing blooms of a unique texture and soft color. Very generous in the number of flowers. A found rose from the late 1980's with a lovely tea fragrance. An Earth-Kind® rose, discovered in 1983 in Georgetown, Texas. Very generous with the number of blooms. This variety was bred in France about 1850. It won the Paris Gold Medal in 1854 and entered into the WFRS Old Rose Hall of Fame in 1988. Best classed as a Tea Noisette. Can be grown as a climber in some areas. La Sylphide was bred in France and introduced in 1838. This bloom is an ever changing surprise of color at times showing any of the following, a light yellow, a light pink blush, a salmon-pink shading, and even a medium pink shading. Bred and introduced in France prior to 1837, this rose blooms in clusters and is very prolific in the spring or summer flush. Bred in 2004 in the US this rose has a scent reminiscent of licorice. Very fragrant with frequent blooms. 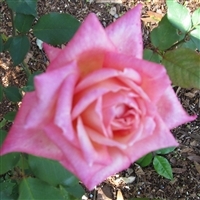 A found rose from the 1970's, this plant has a mild tea fragrance and grows as a shrub with generous blooms. Starting in France in 1880 this rose is known for bushy growth with generous flowering. Blooms open white with some pink shading, aging to a light salmon color. A Bermuda found rose, This flower produces a sweet fragrance. It blooms in clusters. An 1892 French introduction. The blooms have a high center with shading of pink, peach and blush. An 1883 introduction from France, this rose opens with the petals flat, then rolls them into a quill shape. Displays subtle variegation within each petal. A French introduction from 1871 the center of the flower is a light yellow to white with a rosy pink on the outside petals. Shade tolerant. A 1901 introduction from France. Brightly colored red and pink with salmon and peach highlights. Large blooms. A Bermuda found rose, with a moderate tea fragrance. Frequent reblooming. Mlle Franziska Kruger was introduced in France in 1873. She will fit nicely in many gardens. Mme Antoine Rebe was from France in 1900. She has a very distinct and vibrant red color at times tending to a vibrant pink tone. From 1864 this variety was once believed to be Comtesse Riza du Parc. The blooms vary in color with climate from buff to apricot and have a strong tea fragrance. She may be grown as a shrub or specimen.